Has anyone else noticed the influx of green this month? Is it spring or the upcoming St. Patrick’s day holiday? Maybe a little of both. So let’s get into the spirit of things a little early. 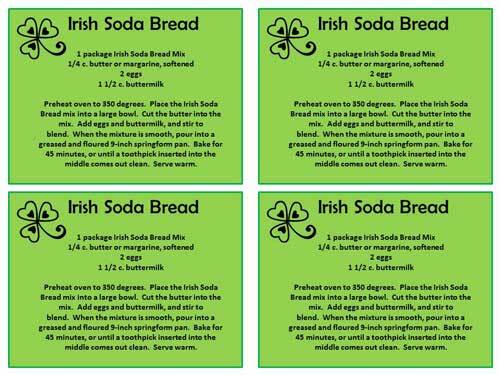 Irish soda bread is a staple at any patty’s day celebration. Not into baking? Well put your worries in a jar. Seal tightly and decorate jar with ribbons, stickers or lipstick kisses. Also, click to print these instructions out to give with the jar. You can do this with many other kinds of cookies and bread and they all make great host gifts but this week just demands a little irish twist. Enjoy! Ever have those sheer panic moments of running late to a party and have nothing to give the host/hostess as you enter their house? It’s honestly the worst feeling for me. I am a stickler for this particular etiquette rule. At a recent housewarming party I attended some friends of mine showed up with a cacti plant in hand! Pure genius. Much easier to maintain than a tricky house plant and it leaves a much longer impression than a bottle of wine. Cactus Gift offers 10 potted cacti in 1″ pots for $20 bucks! Not only will you have gifts on hand but they add a touch of green to your windowsill. It also can be a fun project to make it a little more personal by painting the pots.